This is a long-tailed salamander stopping on a rock as it travels across a shallow stream. 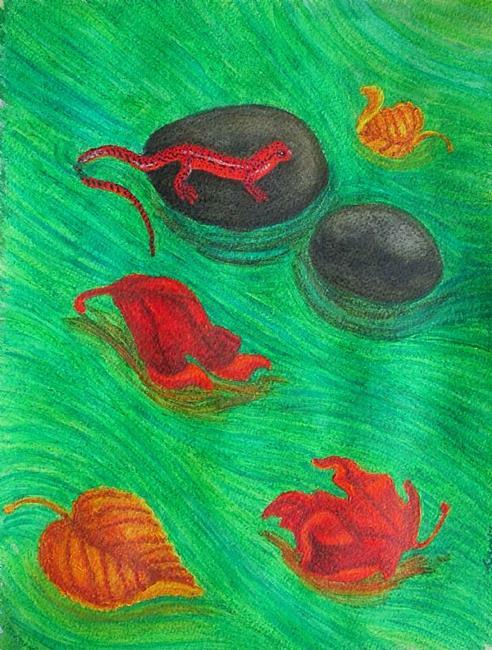 It's a North American species and I thought the bright colors of the fall leaves would set off the red of the amphibian. The picture was my first try at using Derwent Inktense pencils, which seemed to require a very different working method than I'm used to, so I definitely need more practice to feel comfortable using them and learning what they are capable of. This painting was included in the 2014 Cold-Blooded Creations Show in Daytona Beach, Florida.